A good riding day with some higher rollers over the first 40 km, then levelling out as we ride along farmland of the Champagne. Dipping down to the Marne river valley at Chalon-En-Champagne, at about 84 km, the lowest point of the ride. Chalons will also be the recommended place to stop for lunch. For those not yet dialed in there will be a route that cuts short the journey by 20 km, avoiding Chalon – just in case.Leave the track at about 42 km into the day, go south on D 982 until you reach Vitry le Francois. Rejoin the official track there. 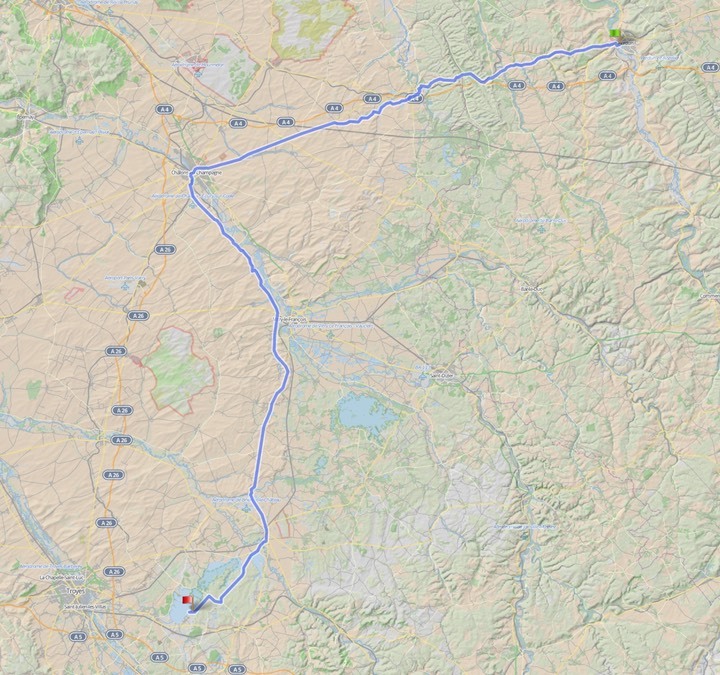 The track follows the Marne valley for another 30 km or so before leaving to the southwest for some more rollers (with fairly limited climbing). Towards the end we reach a forest area with large lake and the campsite close to Lac d’Orient.